17 Comments As an Amazon Associate I earn from qualifying purchases. Ice color mixing was a great way to discover how primary colors mix to make secondary colors. All you do is fill up an ice tray 3/4 of the way with water. 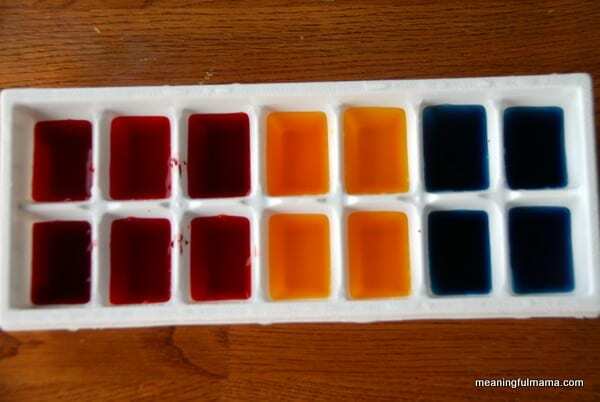 Then, add red, yellow and blue food coloring to the different compartments of the ice tray. I made several of each color so we could really play. Once you let those freeze for a couple hours, you are ready to go. 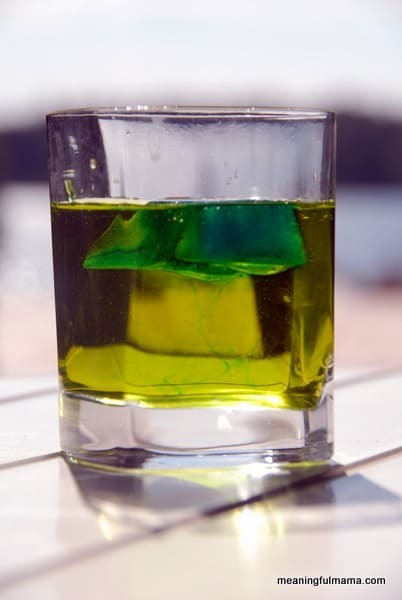 You then fill some clear cups up with water and add red, yellow and blue food coloring to those cups. 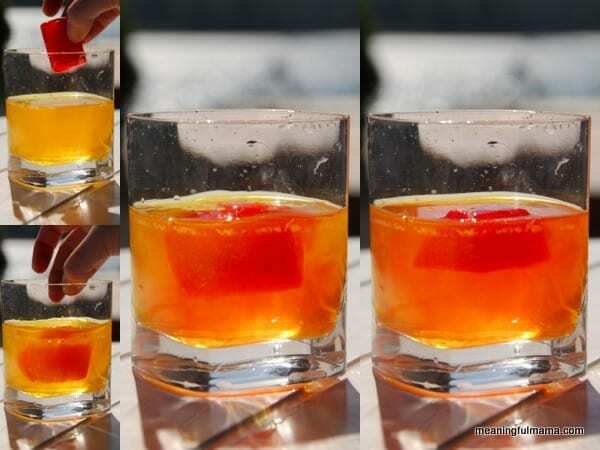 The last step is to drop the ice cubes of varying colors into an opposing color and watch to see what color it changes to. After we did primary colors, Abby wanted to try and mix some of the ice cubes with secondary colors to see what would happen. What a fun way to really play with color. I got this idea from The Mother Huddle. What a lovely idea. I do hope you’ll visit me at My Dream Canvas! You are amazing at photography and have such an idea for design. What a beautiful site. Thank you for dropping by mine too. This is a great idea! I love your pictures too! I’d love if you’d link up to my Teaching Time for Toddlers post! Thanks for letting me know about this. I linked up this post. You don’t have to wait long. It’s pretty fun to watch. I hope you’ll try it. Thanks! I hope you have fun with it. Thanks for stopping by. Wow, this is such a creative learning idea. I’m definitely pinning this! Thanks for linking up to Thinky Linky Thursday! Thanks for the pin. We had a lot of fun. 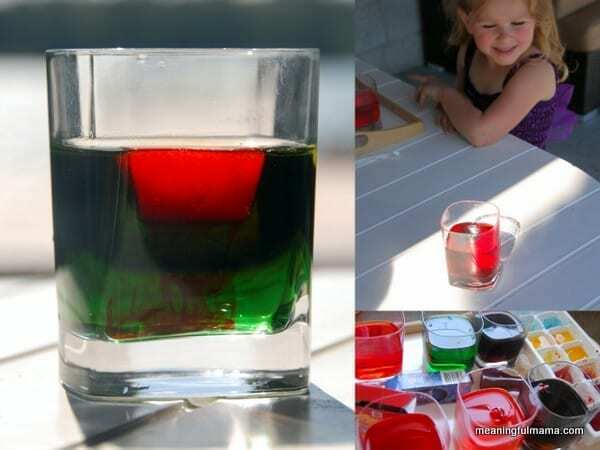 Another great activity for us to try. I pinned it as well. Thank you for sharing at Sharing Saturday!! Just wanted to let you know we tried it today. I will be linking back to you in my post that will be up at 9 p.m. EDT tonight. Thank you for the fun idea. My daughter loved it and asked if we could do it again some time. I am so glad you tried it and had fun. Thank you so much for linking back to us. I appreciate that!